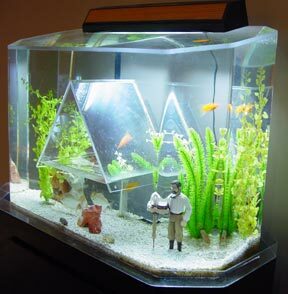 This inexpensive unit still provides the quality and features that Fishure Tanks are known for. Included are the five year warranty, super clean AquaSafe filter system, and unique Fry Man patented "central feeding hole". Though the Safe Haven does not feature a built-in safe, a hidden alcove does reside in its base. This tank is our most popular and considered the best value for those looking for an excellent tank, with our trademark safe, who don't want to pay a lot of money. On the Safe Haven II's the safe is accessed via the “safe” button located directly above the feeding hole, on the back side of the aquarium. All Haven II's also include the highly efficient ClEnvi 1800 Filtration System (winner of numerous awards) and the AquaLight Pump System. A Colbert glow lamp is also included. Both the Safe Haven III and IV models are built for the more serious hobbyist. Both include “safe” activation buttons built into the Colbert glow lamp on/off switch (hold down the switch), for a higher degree of protection and secrecy. As well, all Haven III"s include the SaltClear™ Filter Attachment for the ClEnvi 1800 System, providing for fresh and salt water operation for an unprecedented level of clarity. The AquaLight Pump System and Colbert glow lamp are also included. The Safe Haven IV is our finest tank, and critically acclaimed for its value. This tank is loaded with our highest quality parts, and is considered a great value for the professional. Not only does the Safe Haven IV come with a combination safe (for that added degreed of security) but also includes the ClEnvi 2000 Filtration System (rated the best filtration system on the market), the AqauStar2 Pump System, and the AlgaeAssasin Chemical Treatment Plan (guranteed to keep water clean for one full year*). The model IV also includes the Colbert2 glow lamp with an extra bulb.